So many things are making me happy this week. We use fine hardwood mulch … it retains moisture, helps to keep down weeds and gives the garden that fresh, finished look! Icing on the cake! Rosa Mundi is making her 2017 debut. Francis E. Lester is huge. More pics of him to come and his neighbor Peggy Martin who is showing a tiny bit of color today! Did you read the article in Southern Living about the Peggy Martin Rose? You can read it online here. Great article! Celsiana is making the herb garden sing. Morning doves made a nest on one of the beams of our pergola over the swings. We love them. Sweet William (Dianthus) is so sweet! A new coffee from my friends, Ed and Sue, in Louisiana — Mello Joy. Seriously you might want to order this online. It is amazing! You can read all about it here. It lives up to its hype! And last but certainly not least, the grand boys. They bring more than happiness … they bring pure joy! Last week I had the pleasure to speak to the New Orleans Old Garden Rose Society and to spend several days with them. I knew I would have a good time, but I didn’t know what a deep connection we would form. Was it the charm of New Orleans or the old garden roses or our mutual love of gardening or perhaps the combination of all of that plus all the stories we shared in such a short time. I doubt there is a more caring group of people anywhere. They take hospitality to an entirely new level. To the amazing Peggy Martin (read her story here) for the invitation, her extra effort as a tour guide — making sure I saw as much as possible in our 4 days together. And, I did! For the lovely guest room filled to the brim with roses. Ahhhh I was in heaven. And, for the opportunity to learn we are twins on so many levels! To MJ for the stories and the amazing shrimp. I’ll be back for more. To Peter Patout for hosting all of us in his charming home in the French Quarter on the historic Bourbon Street and serving us the most delicious crawfish etoufette. To Leo Watermeier for the tour of the beautiful rose garden in Louis Armstrong Park and for his tireless work in caring for these historical roses! I’ll be back to see them bloom! And, for choosing the perfect lunch spot — Li’l Dizzy’s Cafe. To Margaret Ganier for all the “fail proof” tips on rooting rose cuttings! I can’t wait to get started! I am determined to make you proud! To Kim Ngan Nguyen for the enthusiatic welcome, finding me on Instagram and getting the books ordered so quickly. Best wishes in finding your much deserved Pearl. And to all the rest of this amazing group, thank you for the warm welcome! As many of you know I have loved roses since I was a teenager but I didn’t start my dive into old and historical roses until the 80s when I read the journal of a young woman who left the comfort of her home to join her husband in a journey west. One of the experiences she described was painstakingly taking cuttings of the roses and plants she just couldn’t live without. As I read her story, I felt as though I was going on the journey with her. Roses were not just for beauty to the women of this era. They were also a source of flavoring and vitamin C (from their hips). Even the most thorny roses were of value as they were used as living fences to protect vegetable gardens and such. 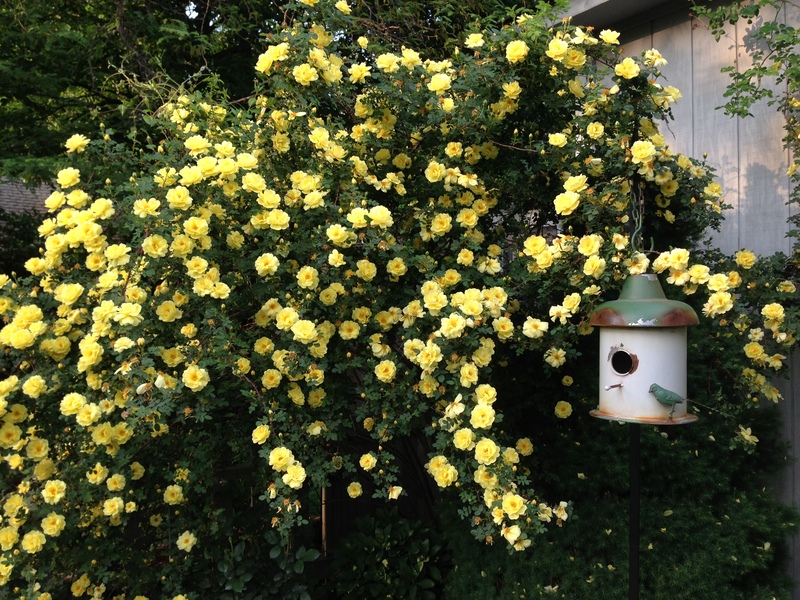 Also during this time we were given Harison’s Yellow (Hybrid Foetida) rose from a friend in Tennessee who had received it from a family member in Ohio. We learned that this rose had been passed through their family for some time. I started doing some investigation and found out just where the rose originated. You can read the history of Harison’s Yellow here. I continue to love old garden and historical roses and have several in my garden. What a joy it is to visit gardens that have these lovely old beauties. 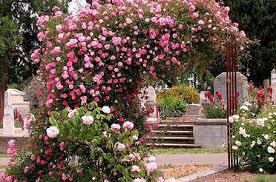 One such garden is definitely on my garden bucket list … The award-winning Sacramento City Cemetery Rose Garden. 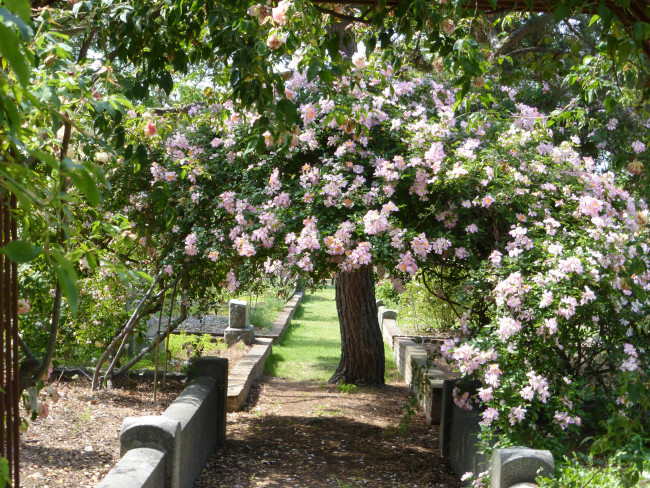 This garden is home to old or antique roses collected from cemeteries, old home sites and along roadsides in northern California. The establishment of the garden was done by Fred Boutin, an internationally recognized rosarian and authority on “found roses,” and Jean Travis, a member of the Heritage Rose Group. Members of this group work to collect, plant and maintain these roses which were popular from the California Gold Rush era through the Victorian/Edwardian era (1850-1915). The collection now includes more than 400 plants–over 200 varieties. For those of you who love fragrant roses, these roses are some of the most fragrant roses that exist. You can imagine how thrilled I was to have Anita Clevenger, Curator of this garden, with us on Rose Chat. Did you know that cemeteries used to be a place to gather for picnics regularly? 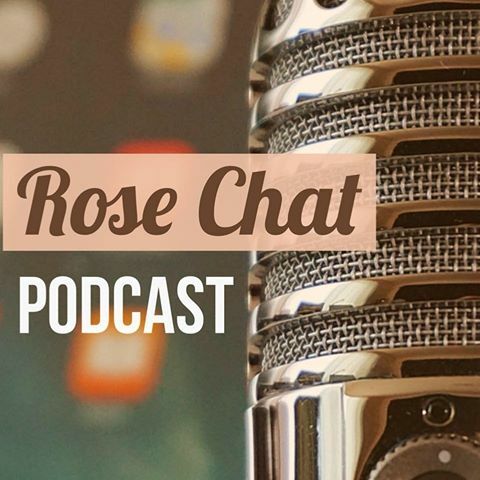 Hear about that and more by clicking on the Rose Chat logo below. For the list of other events in the garden this year, read on. This is Bloom Thyme Friday on Sunday. I have had so many friends and family in the garden this week, I didn’t have time to post on Friday. YAYAYAYAYAY What a blessing!! Don’t you just love having friends in your garden. I know my garden is a “wee bit” larger than most backyard gardens so I get many requests for people to come and I just love that! Early June is the best time in my garden. That’s when the old garden roses and rugosas have their heydey and fill the garden with the most amazing blooms AND fragrance. 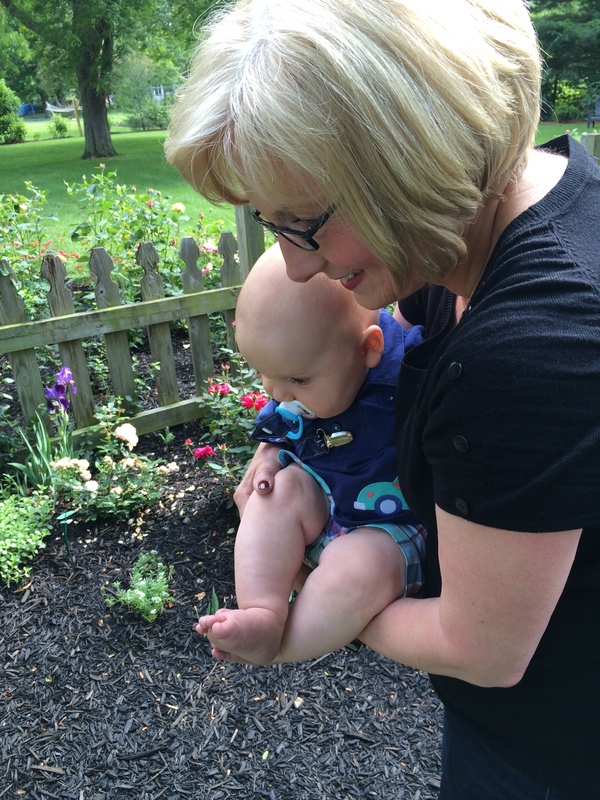 Here is my favorite visitor to the garden this week to help me wish you a HAPPY BLOOM THYME FRIDAY! Actually Mr. H wishes you a HAPPY BLOOM THYME SUNDAY!